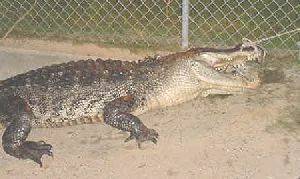 Here it is folks, 500 LB Gator caught by Jeff Johnson on September 21st, 2001. 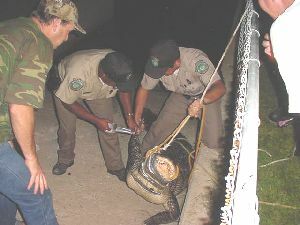 The Gator was caught on the Main canal between Ling & Barracuda. from side to side till he was brought to the boat ramp on Sailfish. 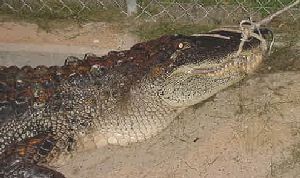 The Mayor & Bayou Vista Police contacted the Texas Parks & Wildlife. 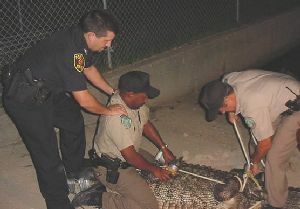 Texas Parks & Wildlife further restrained the large gator & hauled him off. 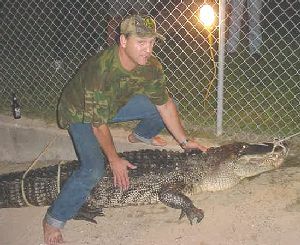 In the photo on the right is Jeff with his biggest catch ever! 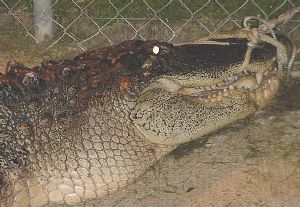 The gator is hanging off the front of the boat. You can only see his head & underside.